June 21, 2014 was indeed a day of blessing as our three novices made their First Profession in our chapel before God and his saints, and before the assembled community and all the guests who graced our occasion. 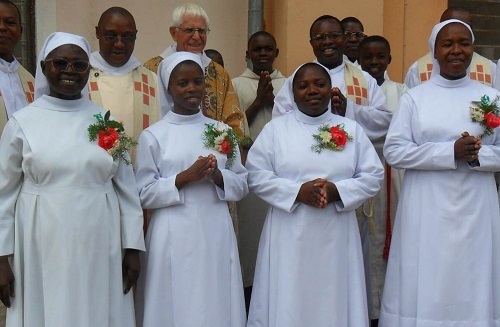 They are now called: Sr Veronica Joseph Nyondo, OSB, Sr Matrida Hilarius Livigha, OSB and Sr Maria Goreti Gires Kapandila, OSB. With the help of choir master Kanuti from Ndanda Parish, the organist William from Nyangao and the participation of some of our OSB Brothers, the community formed a good choir and successfully sung with joy during the profession Mass. The day went well, thanks to the cooperation of everyone in the different departments and respective responsibilities in the community.